On Saturday, September 8, 2012 The Urology Center of Colorado Foundation held their 3rd and most successful Blue Shoe Run for Prostate Cancer. We’re pretty sure it stemmed from all the posters distributed this year by our interns, Richelle and Bree. 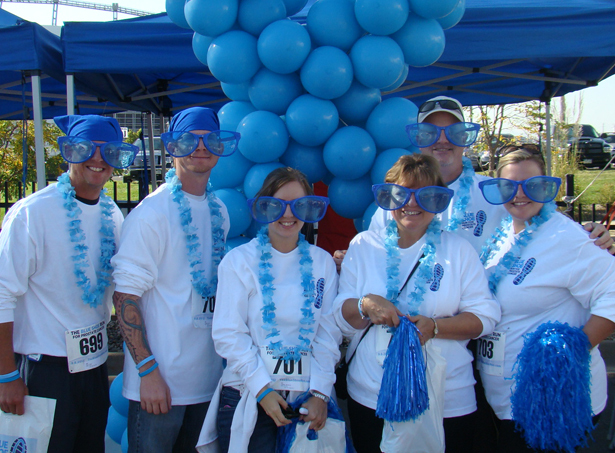 Over 1,000 people donned their Blue Shoes and ran in an effort to raise money to stamp out prostate cancer. Our Vice President, Maggie, was even joined by her dad this year who completed the race in record time! We’d like to give a special shout of thanks to 7News Anchor Mike Landess and Denver Mayor Frederico Pena who provided incredible support during several on-site interviews and led the post-race prostate cancer survivor recognition ceremony. The Blue Shoe Run has raised more than $300,000 for TUCC Foundation since its inception in 2010. We hope you’ll join us next year to continue the fight for your father, your brother, your husband or your son!